Much like beauty is in the eye of the beholder, music is a wonderful form of art where lyrics can be interpreted in many ways. Lyrics or poetry can mean something entirely different to two people or even to the same person on different days. Sometimes music makes me feel better. Sometimes it makes me feel understood. On a rare occasion, I was driving alone in the car listening to the radio [instead of the typical nursery rhymes or Disney sound tracks]. On that day, I had a peaceful moment of clarity where I was able to focus on the music— instead of the usual screaming and complaining coming from the backseat. The songs I listened to, although not designed for parenting, seemed to fully apply to my life. 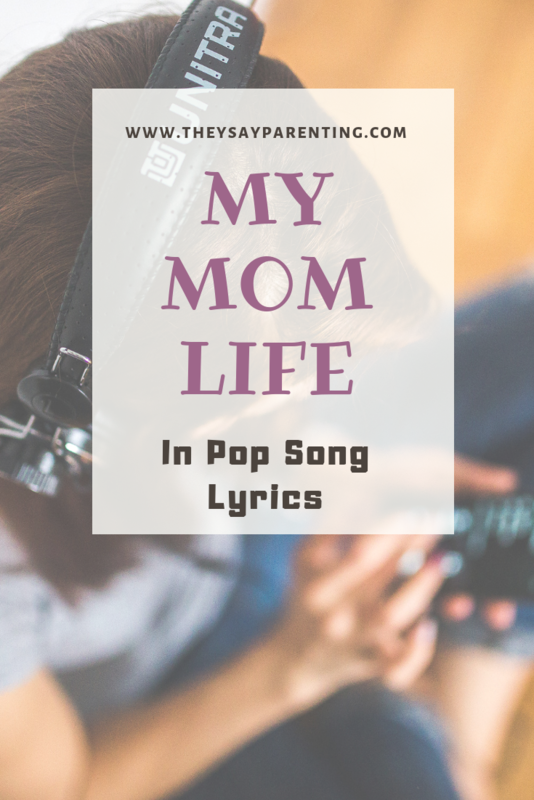 Although these songs are clearly not about “mom life” or parenting, some of the lyrics seemed so fitting in my life when I heard them. Some gave me clarity. Some made me feel understood. Some brightened my day. It’s funny how easily songs can change my perspective or improve my mood. In fact, if I listen to the right song when I’m feeling down it will usually pull me out of a funk. …there are days when I feel like I have let my kids down. The “voices in my head” are loud and quick to tell me how I could be a better mom. But, all these voices are is that negative self-talk creeping in. The truth: we aren’t perfect. We are human. We are parents, and we are good parents. The fact that we even care proves this point. There are also the times when I worry or become anxious. What don’t we worry about as moms? Is my child eating enough? When it comes to illness, will my child be okay? Will my child ever sleep through the night? When they are picked on or left out, will my child be okay? These lyrics are a great reminder during these moments. Sometimes, rather than focusing on the worry, we simply need to “let it be.” Typically, everything I worry over ends up being alright in the end, and I have caused myself unnecessary stress for no reason. “Oh baby, why don’t you just meet me in the middle? When it comes to toddlers, aren’t they usually “all or nothing?” I swear, it can make me feel like I am losing my mind sometimes. Can we seriously just meet in the middle here? Can we make a compromise? Compromise and choices have gone far in saving my sanity. There will be late nights. I will never forget those nights when my children were babies and it was just us, rocking in the quiet. We will be there for them in times like this, and we will continue to be there for them as they grow. We will be there for them when “things go wrong.” We will hold them and kiss their tears. In fact, we may give too much. How easy is it as parents to put our kids before ourselves, to put our children before our marriage or relationship, to put ourselves last? There are times we can give so much of ourselves as parents that it is hard to find anything left to give. This song reminds me to make sure I am also giving to myself so that I can stay strong and handle the moments when I feel like giving up. For me, finding me-time can help prevent these “moments.” Additionally, by leaving time for myself, I can more fully be there for my kids. I feel so much emotion when I hear these words. We are going to “get old,” and so will our kids. I bet we will look back and see more magic than stress. Maybe I am “missing what it’s about”—focusing on the past, worrying about the future, missing out on the now—just as the song says. It is so easy to get lost in the past or be so focused on the future that we miss what is happening right before us. There is something about realizing that these days are the “good old days.” In the moment, it might seem like a mess. It may seem mundane or never-ending. Sometimes it’s hard to hear this when I’m having “a moment,” but it is the truth. I know I will miss these days. I don’t want to look back and believe I didn’t realize what I had when I had it, or to feel like I missed out on moments. So, for now I will continue to try to be as present as I can be. …And this song, don’t we want so much for our kids? It’s hard to even put it into words. Just the fact that we want all these things for them and that we would do almost anything to help our kids achieve them, doesn’t this mean everything? Doesn’t this make us great parents? This hope, these aspirations, this drive to give and teach them everything. This is love. Children can bring us frustrations, worries, and fears, but they can also bring us so much joy. Even in our faults, they still love us to their core. There have been nights when I have felt I yelled too much at bedtime—like the night my son had me chasing him in circles until I was out of breath. On these nights, I feel like I failed them. I feel like I wasn’t calm enough or caring enough. But in the morning, they still open their eyes and look at us like we are their favorite person in the whole world. And there is not a day that I don’t look at them in wonder. I’m just waiting to see what they will add to this world one day. No matter the frustrations, the lack of compromise, their inability to meet us in the middle, the amount we have given of ourselves, or the hard, long days and nights. No matter how many times we feel like the “walls are caving in” or the number of times we feel like giving up, we won’t. Because we will be there for them… always. After all, they are our everything. You may also enjoy: Managing Self-Talk As a Parent: Ask Yourself This Question or Moms Have Tantrums Too!